1. My intensive regime of Olympics watching over the last fortnight hasn't given a great deal of time to spare to the world of movies. 2. Only one of the films I've seen recently really stood out. The rest were just fair to middling, with little for me to say about them. 3. I'm about halfway through Jon Ronson's brilliant non-fiction book "The Psychopath Test" and I'm very keen to finish it off tonight. I'll start with my clear 'pick of the fortnight' - David Cronenbourg's crazy adaptation of William Burrough's (apparently) even crazier novel, Naked Lunch. It's pretty much impossible to capture the madness of this movie in a few sentences, but it concerns the life of an insect exterminator who accidentally kills his wife and is forced to flee to a North African haven for criminals known as 'Interzone'. Whilst there, we get to meet secret agents, giant insects who literally talk out of their backsides, junkies who inject ground up caterpillars into their arms and disgusting fleshy typewriters. 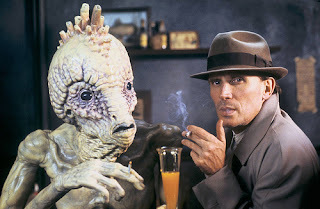 While I can't say I ever completely understood what was going on, I loved Peter Weller's central performance as William Burroughs' surrogate, and I can safely say that I was never bored. If only the rest of the films I saw this week were as memorable. Carnage is Roman Polanski's latest - a comedy of manners, set in an upper-middle family's home in Manhattan. It's occasionally drily amusing, but feels very stagey - more of a play than a movie. The Kid With A Bike came out to a great deal of critical praise, and concerns a troubled young boy growing up on a housing estate in Belgium. I felt that this one was well made and well acted, but it's rather a low key affair - there's never too much at stake. On a similar theme of bicycles and poverty, I rented Bicycle Thieves on the basis of its consistently high showing in the Sight and Sound Top Ten list. I have to be completely honest and admit that I was really exhausted as I was watching it, and kept drifting off to sleep. From what I saw, there wasn't too much to be excited about, but I should probably give it another try when I'm a bit more wakeful. Finally, we have Cyrus, which is kind of like what Step Brothers would have been like if it had been made by the Duplass brothers. It takes things in a more thoughtful, talky direction than Step Brothers, but for a film billed as a comedy, it largely neglects to include any laughs. What's most astonishing about the film is that Marisa Tomei was 45 years old when it was made. She must have access to a time machine or some sort of elixir of eternal life, because she looks about half that age. "Blake: We're adding a little something to this month's sales contest. As you all know, first prize is a Cadillac Eldorado. Anybody want to see second prize? Blake: Second prize is a set of steak knives. 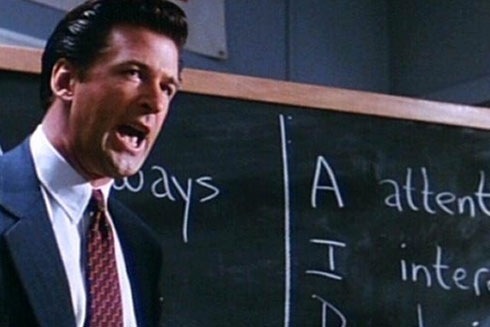 Third prize is you're fired."